Home » Blog » What’s New At Your Davidson Dentist Office? Hello, friends of Dennis J Coleman DDS – Family & Cosmetic Dentistry. Today we’re talking about a modern dental office in Davidson, North Carolina. Dentistry is a field of continual innovation. There are always new and improved ways to help Charlotte residents have the healthiest and most beautiful smile possible. Many dental offices in the Huntersville, Cornelius, and Lake Norman areas have found that switching to digital X-rays makes for more efficient appointments. This is because the dental images can more easily be stored in a patient’s computer file and compared with past images. Diode lasers are innovative instruments that allow your Davidson dentist to detect bacteria levels in your mouth as well as find and treat cavities. For patients interested in cosmetic or restorative dentistry, CAD (computer-assisted design) technology can allow procedures that involve dental crowns and bridges to be done in fewer appointments. If you are considering a full smile makeover and want dental veneers, the newer, thinner veneers are just as strong and beautiful, but more of the original tooth is left intact. If you’re looking for an experienced Davidson dentist, then Dr. Dennis Coleman is the one you’re looking for. 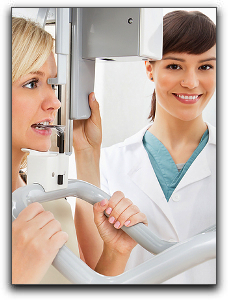 At our practice, we want our patients to have the best oral health possible. Dennis J Coleman DDS – Family & Cosmetic Dentistry is located at 460 S Main St Ste 101, and our caring dental team is always ready to welcome new patients. We offer a large variety of dental services for our patients such as cosmetic dentistry, dental implants, dentures, general dentistry, and restorative dentistry. Call 704-896-5850 today to schedule an appointment with a professional Davidson dentist.